Whether you’re an auto dealer, repair shop, parts center, having the item your customers need on-hand is essential to providing good service. Quickly accessible parts that are kept well organized is not only important for employee productivity, it’s important for your bottom line. 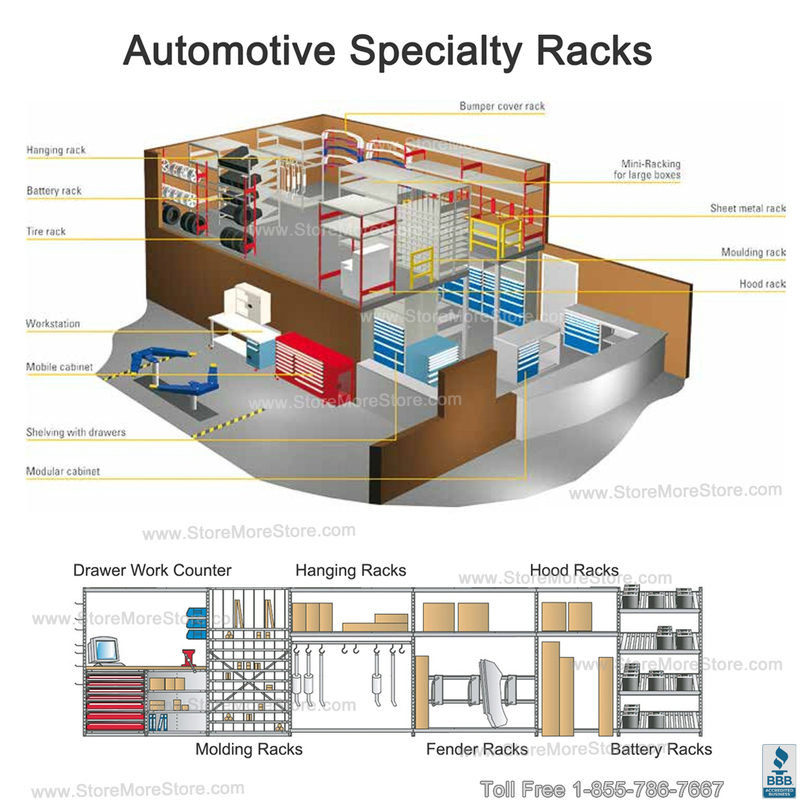 StoreMoreStore has 5 types of automotive parts storage solutions that will improve the way you do business. Using tire storage racks is a great way to keep tires off the floor. The tires will be easier to retrieve and inventory will be easier to count. Also, you reduce the risk of employees tripping on tires when they are neatly organized in the racks. Windshield storage racks house both car and truck windshields. The racks will keep the glass windshields safe and secure so that there is no damage to them. The floor mat racks will organize and efficiently store and display all sizes of automotive mats in the carton and on hanging hooks and rods. With both wall mounted and stationary options, the bumper racks are the ideal solution for securing bumpers. Keeping bumpers on the wall makes them easy to lift. The stationary racks are double sided to offer more storage capacity. These are just some of the automotive parts storage solutions you can find from StoreMoreStore. If you have any questions or need assistance, give us a call at 1-855-786-7667.